Tired of explaining the red cheeks that make you look like you’re always blushing? 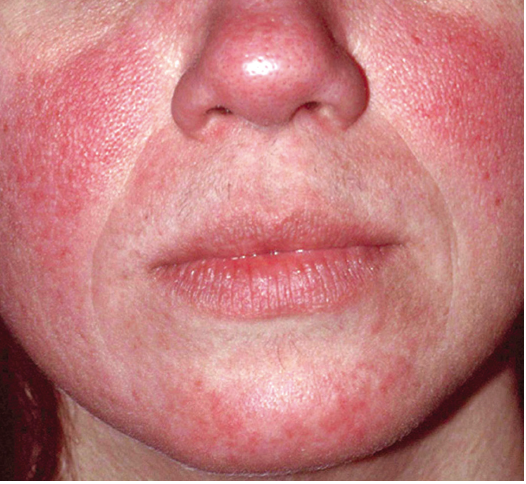 Rosacea is that rosy glow you wish you didn’t have. It’s often triggered by changes in temperature, stress, eating spicy foods, or alcohol. For many, this annoying reddening of the skin is genetic, caused by abnormalities in facial blood vessels. Rosacea affects both men and women, causing redness on the nose, chin, or cheeks, and sometimes pimples can accompany the redness. After the initial redness, broken blood vessels often show through your skin which can gradually thicken and swell. Dr. Marcia Hartt Medical Aesthetics has several effective treatments to control rosacea and give you back your even complexion. Treatments for rosacea include IPL-DPC Skin Rejuvenation, IPL-DPC Vascular, medical grade skin care, medical facials, chemical peels, and SilkPeel DermalInfusion Microdermabrasion. Medical aesthetics CAN keep that genetic trait a family secret. Put your best face forward and feel confident. Book your free skin analysis today. Facial blood vessels are usually not visible when we are young, however as we age, facial vessels can appear closer to the skin’s surface. Spider veins are those squiggly little clusters of red, blue, or purple facial veins can appear on the nose, the cheeks, or other areas of the body as well. Genetic factors, exposure to sun, illnesses, and high blood pressure are a few common causes. If you’re tired of reaching for the cover stick, consider IPL-DPC treatments instead. Call Dr. Marcia Hartt Medical Aesthetics for a free skin analysis today. Your facial vessels can disappear with just one treatment.